Stepping out of the taxi in a dry, dusty lane, I’m in a village much like any other in The Gambia. The roads here are simple dirt tracks lined with the crumbling walls and make-shift fences that mark out each family’s compound. There are no street names let alone house numbers. If you are in unfamiliar territory and you want to know where someone lives, you need but ask. While the village may be typical, the day is not. 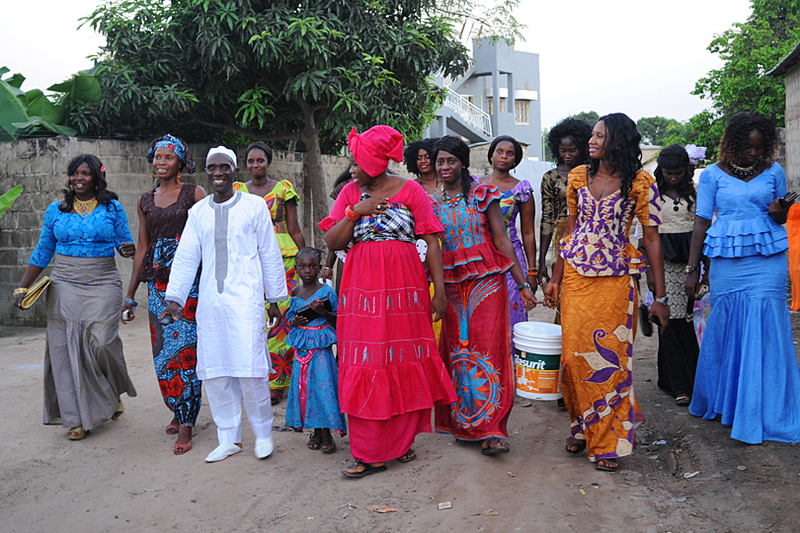 Today my friend Okameo from Guinea Conakry is getting married. There’s a tangible buzz in the air as ladies in their gloriously coloured dresses are coming and going. Children bring out plastic chairs and line them up against the walls. A cable with a couple of light bulbs is hung up across the street. Musicians are arranging their drums, blocking off one end of the road. Before long they are firmly ensconced and it was clear that no more cars would be coming this way for the rest of the day. The music and dancing begin. A sofa appears from one of the compounds and is placed in the middle of the street ready for the guests of honour, the bride and groom. The seats start to fill and more join in with the dancing. Over the next hour or so more and more people arrive. The groom looks splendid dressed all in white and grinning from ear to ear as he walks up the street to join us. 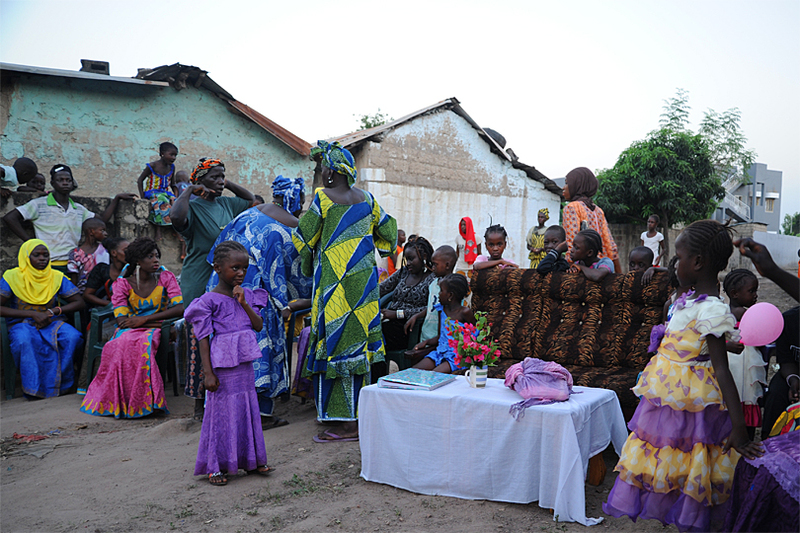 In the Gambia the majority of people are Muslims with about 10% Christians and there are many different tribes. Marriage between tribes and even religions is common. Okameo from Guinea and his Gambian bride, Asanatou, are from different tribes but they are both Muslim and they have already been to the Mosque for the formal part of their wedding. In the village the light is beginning to fade but there is still no sign of the bride. I had caught a glimpse of her earlier that day or at least a shoulder peeping out from beneath beautiful long black tresses in the hairdressers just around the corner. Such things are not to be rushed. Not that anything is rushed in The Gambia. At last, further up the street, a beautiful young lady appears, all in white, with shimmering diamonte jewellery and a smile that would win any heart. She is surrounded by her friends and sisters, all exquisitely dressed and gracefully gliding through the dust in high heels that I would surely break my neck in. The bride’s gown is cut in a traditional fashion but being all in white, looks stunningly elegant against the vibrant colours of all the other dresses. We dance to the frantic rhythms and the celebrations continue on into the early hours. Periodically I pop some money in the tray the musicians are passing around; having plenty of small notes is essential at an event like this. 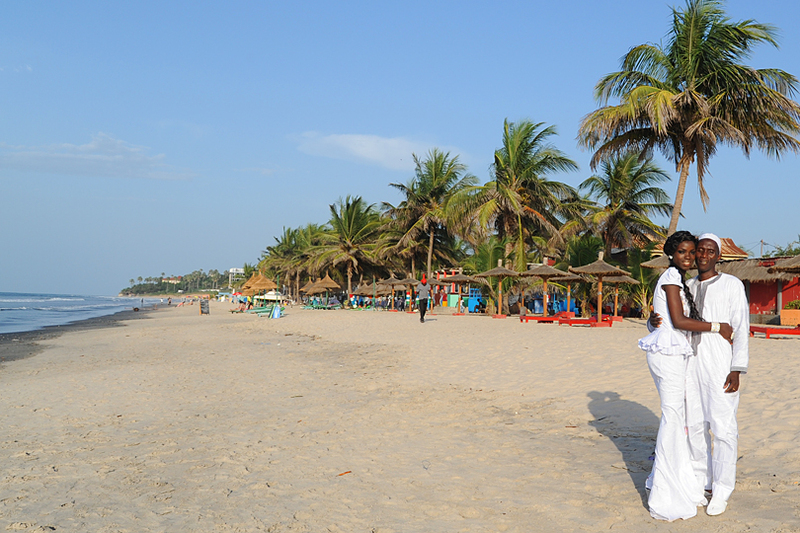 The next day, as I’d not had a chance to photograph the bride in day light, I invited Okameo and Asanatou for a mini photo shoot at my hotel, Kombo Beach, a popular wedding location. I had given them an album with the promise of many photos to fill it to follow and they could hardly have a wedding album without some pictures of the bride. Okameo is one of the loveliest people I have ever met. It is only thanks to him that a school in The Gambia, that I helped raise funds to build, was ever finished, as when the project managers on the build pulled out, he stepped in. He’s also a great music and dance teacher, playing with the excellent percussion group Toumaranke. He’s taught me a few nifty dance moves over the years which came in very handy at his wedding. It was certainly a day I won’t forget in a hurry and I wish Okameo and Asanatou all the very best for a long and happy life together. 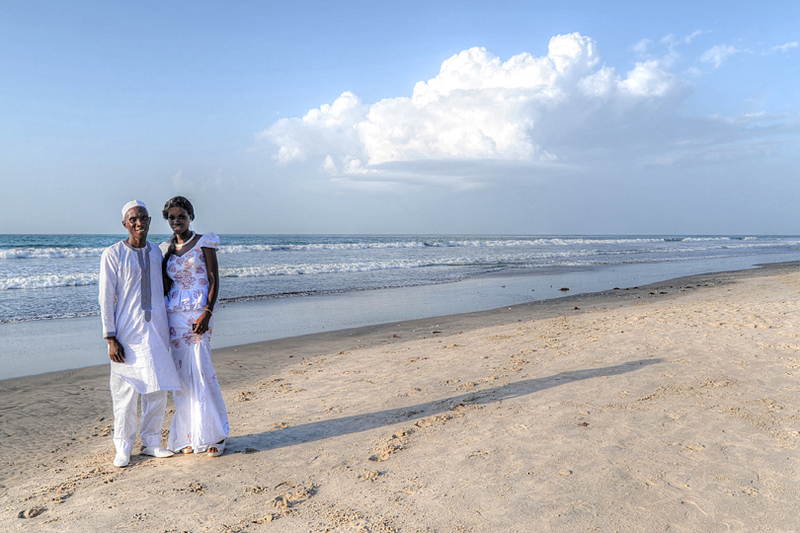 Are you thinking of planning your wedding or honeymoon in The Gambia? 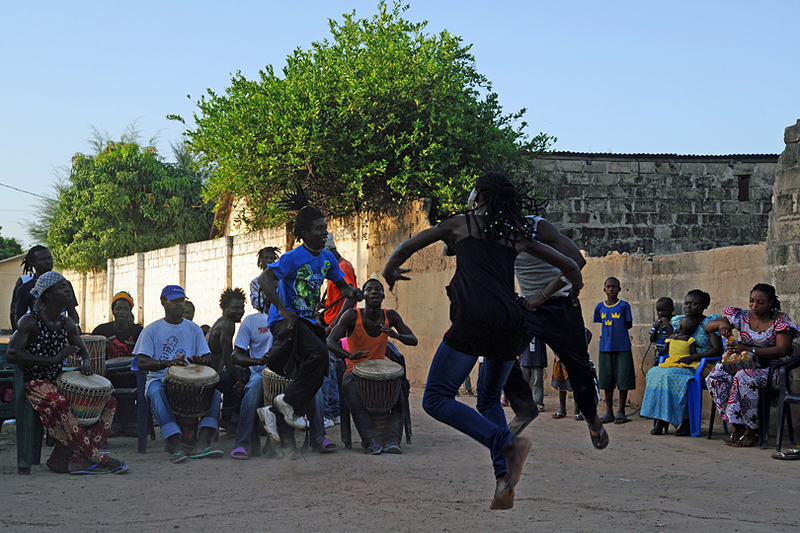 The Gambia Experience have organised hundreds over the years. Visit our website to discover more.